This building is in the extremely beautiful little town of Micanopy, Florida. It's part of the Micanopy Historical Society Museum here. I photographed it the first time without knowing what it was---I was that fixated on the way the roof was reflecting the sky---but I've been since. It's well worth a look. The whole town is most definitely worth a look (and a detour from I-75). If you like antique stores and appreciate a bit of true "Old Florida" atmosphere, this is the place. 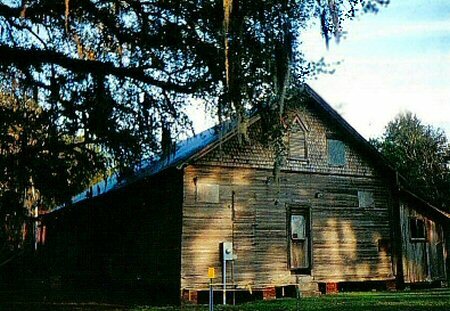 Micanopy--- in Alachua County, Florida, near Gainesville---claims to be the oldest town in inland Florida. This photograph was taken between 1998-99. Because of the shops, I have been there many times, so I'm not sure anymore which photograph are from which trips. There's a fabulous bookshop. I thought I'd never get Nick to come out of it. The main street consists of some truly beautiful and characteristic old buildings; years ago, the Michael J. Fox film "Doc Hollywood" was filmed there. It's particularly charming around Christmas time. There are some wonderful bed and breakfast inns; it's very romantic in a gentle, old-fashioned way. One of my friends from Gainesville says that she and her husband spend every anniversary there. If you're exploring Florida, be sure to add it to your list. I always think there is something special about Florida's light, but I don't know; maybe it was the same everywhere else I've been and I just didn't notice. One thing I learned---because the photography really started during one of the worst times of my life---is that learning to notice the small details can really enhance your experience of the world. For me, it changed everything. One way to learn to see details is by looking at the world through a camera lens. It gives you a frame and forces you to focus. You start paying attention to the way the same scene changes depending on the time of day and the angle of the sun. The colors change as well.